Wide angle photography on the other hand, most often has a fair amount of blue water in the frame and will not reflect back strobe light to the lens. This can potentially wreck havoc when using TTL, especially matrix balanced TTL as the foreground will then be overexposed or burned out. Some people still useTTL when shooting wide angle and attempt to compensate for the blue water by under exposing by 1, 2 or more f-stops or somewhere in between. This will sometimes work, other times not. If this is your preference, bracket with exposure compensation proportionate to the amount of blue water in the image. If you are like me, you probably started out in underwater photography by shooting a Nikonos V (or Sea and Sea) with framers and extension tubes. As time goes by, however, certain limitations of this system can get frustrating. As such there is a tendency to move to a Single Lens Reflex (SLR) camera which is either amphibious by nature or is housed in a metal or Lucite housing from one of the many good vendors in the business. An SLR allows more creativity and control over the results since in most cases you see what you are shooting in the viewfinder (in certain cases, however, less than 100% of the image is in the viewfinder),but it also requires more skill than simply placing a framer over a subject and pressing the trigger. 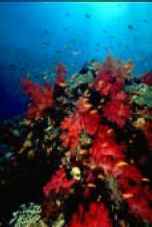 While this will certainly remove many of the limitations imposed by not using an SLR camera, it also will whet your appetite for shooting reef scenics and large marine animals rather than small marine animals that move slowly. These larger reef scenes are normally taken with a wider angle lens, which can vary from 14mm to 35mm. I personally favor the Nikonos 15mm lens for the Nikonos V camera, and a housed 18mm lens for a housed 100% viewfinder camera such as the Nikon F5. Don't take my personal preferences as more than recommendations of what I personally like. When shooting macro subjects almost everyone uses TTL simply because it is easy and will work nearly all the time; wide angle, however is a different situation. While there are exceptions in macro photography, such as if your subject is extremely dark, extremely light or extremely reflective, or there is blue water in the frame, TTL will give good results probably 95% of the time or more. For macro, if one understands the limitations of TTL, there is no reason not to use it. What I do is determine the background exposure by spot metering on the blue water I wish to be exposed properly. This is usually away from the sun, normally at a 45-60 degree angle. 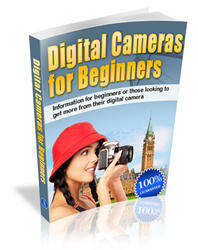 It is essential to know where the spot meter is located for a given camera. For example, the Nikonos V, the spot meter is located in the lower center while most in most SLR cameras the spot meter is in the focusing area, generally the center of the frame unless they have variable focus points. Generally this suggests shooting upwards as much as possible because the difference between upper and lower blue water, shooting horizontally, is approximately two f-stops. If you simply shoot horizontall,ythis will make the top blue water of your image look overly light and the bottom water overly dark. This combination of f-stop and shutter speed is my base exposure that I set manually. In tropical waters with reasonable visibilit,y a good guideline for ISO100 is f8 at 1/60. If I am shooting scenes where the primary subject does not move much, such as a reef scenic, I use a higher f-stop and slower shutter speed to increase depth of field. 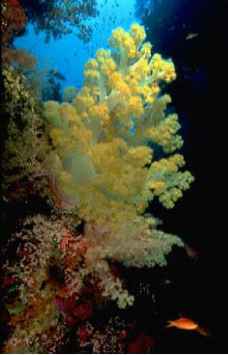 For example, this reef scenic was shot using Velvia ISO 50 at f5.6 and 1/60 nearly straight upwards. Notice that the blue is an even color and does not go from light at the top to dark. Remember that not all reef scenics should be shot horizontally. 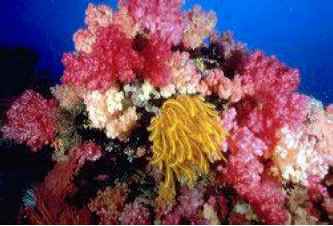 Sometimes the subject, like the soft coral below, should be shot vertically. Some people tend to compose vertically naturally and have to think horizontally when appropriate, while others are just the reverse. To effectively freeze sunbeams requires shooting at 1/250. 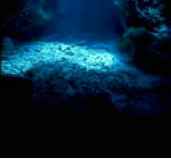 Notice the dancing sunbeams on the picture below shot at Devil's Grotto in Grand Cayman. This was shot at an aperture of f2.8 and 1/250 of a second. Successful images have a subject that stands out. Too often I see photographs where the subject blends into the background (sometimes called negative space) and simply fails to grab one's attention. This often occurs when shooting down on a subject. If you are aware of this problem when composing an image there are various ways to make a subject stand out or "pop". Making a subject "pop" involves creating contrast between that subject and its background or negative space. There are three easy ways that this can be accomplished. require a synch speed of 1/250 which some cameras (including the Nikonos RS) do not have. This image was shot at f5.6 and 1/125 using Provia 100 in Kavieng, Papua New Guinea. The focus was preset and subject to strobe distance matched at 2 feet which resulted in shooting at quarter strobe power on an SB104. The animal is highly reflective so it was better to slightly "under strobe" the subject. Photographing a subject against a background of a completely different color can create contrast. 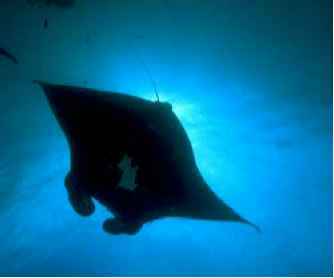 This could be a black background, which can be easily created by shooting with a small aperture, e.g.0 f16 or f22 and fast shutter speed, a blue water background, or a different color background as shown by the photograph of a manta ray against a sunburst and blue water background. While I lightly exposed the bottom of the manta with strobe light, it stands out quite nicely from the blue water. Again I had set up exposure matched strobe and focus for two feet and simply waited for the correct shot to occur. Another way to create contrast is by using negative space to accentuate an interesting subject. This can be done by shooting in silhouette. Remember if you cannot see a silhouette, you cannot shoot a silhouette. This photograph of a manta ray accentuates the contrast between the light of the sky and the dark of the subject with no strobe lighting. Once you have determined the basic exposure for your blue water background, you have a shutter speed and f-stop combination. F-stops are tradeoffs with shutter speed, as each will change the amount of light that reaches the film by * (if you increase shutter speed by one click, e.g. going from 1/60 to 1/125) or double the light by increasing the aperture by one stop, e.g. going from f8 to f5.6. Strobes, howevesince they are shoot very fast relative to shutter speed, don't care at all about shutter speed selected. They care only about f-stop and distance to subject. Most strobes have a table of strobe to subject distances; however for best results, shoot a test roll to verify that this table is correct. Many strobe manufacturers tend to exaggerate their guide numbers to make their strobes seem more powerful than that of their competition. For wide angle photograp,hy wide angle strobes which cover about 90 degrees are ideal. Optimally they should also have one stop increments in power setting. That is "full", "half", "quarter", and so forth. If an image is pleasing to the viewer it works, and generally this means that it is composed well. There are two ways to accomplish this. The first is to think about what makes good composition while shooting your pictures and the second is to take all the pictures from a given photo shoot and throw away those that are badly composed. Which makes more sense? It is up to you, the photographer, to decide. I personally find that unless I think about composition while shooting that I have far too many images to throw away when culling. Good composition means that picture elements produce an overall pleasing, unified, and harmonious whole. While this is highly subjective, there are some guidelines, which will help composition be pleasing and cause your eye to gravitate to the subject. Think of every image as if it were a tic-tac-toe layout with two vertical and two horizontal lines. The intersections of these lines are called "crash points" and these are the power points that will easily draw your attention or that of your viewer. Placing your subject at one of these crash points will create an image that is more powerful and able to keep the interest of the viewer. It gives a feeling of balance and harmony and keeps the image from being boring. Too often, placing the subject in the center of the image makes the picture look posed. So, in effect this is asymmetrical composition where the subject is not centered or if it is centered, the eye of the subject is at one of the crash points. When the subject is placed on one of these power points or crash points, it is highly desirable that it be positioned such that movement is into the frame rather than out of the frame. The former feels right while the latter creates a discordant feeling. Look at the preceding images in this article and notice that they use those points wherever possible. of blue water in the image below is about one third of the total image. If it is necessary to center a subject try not to have the subject centered and parallel to the bottom or top of the image. Often times creating a diagonal can cause a mundane subject composition to be more interesting. While finding good subjects is essential to underwater photography it is not the end but rather a means toward an end. The best images are those with the best negative spaces and this is true of wide angle as well as macro or close-up photographs. What makes your pictures stand out from those of all the other underwater photographers in the world is how you compose and how you use negative space creatively. A good photographer does not take pictures; a good photographer makes images. This is especially true for wide-angle photography. Personall,yI often look for superb negative spaces and then find subjects within those areas. Try to get the most out of a given subject. Good subjects are difficult to find so don't simply take one photograph and move on. Shoot the same subject from different viewpoints, directions, and sides. Look for creative ways of showing how the subject fits into its world. Look for simplicity rather than complexity so the subject does not get lost in a myriad of detail. Consider shooting both vertical and horizontal compositions of the same subject. If you want your pictures to be better than average get closer. Then, get closer again. Having less water column between your camera lens and your subject makes for better color saturation, better clarity, greater enunciation of detail, and less strobe power required to light the subject properly. In wide-angle photography this means using the widest lens available as long as it matches the dome port that contains it. If it does not, the corners of your image will be less than sharp. Backscatter is caused by lighting pieces of particulate in the water before or in front of the subject being photographed. Backscatter is not inevitable even in water heavy in particulate. The only way to avoid backscatter, other than photographing in crystal clear water such as found in a swimming pool, is to paint the subject with the edge of your strobe beam rather than aiming the strobe directly at the subject. Obviousl,y decreasing the amount of water between the subject and the lens reduces the backscatter opportunities by reducing the water column between camera and subject, but painting the subject with the strobe edges will work even in murky conditions. I personally prefer the use of two strobes rather than one especially for wide-angle photography. If you use only one strobe you are forced to point the strobe somewhat inwards and this will result in backscatter. Most often I have one strobe on the left and one on the right of the subject, both slightly above the camera, and both slightly pointing downwards and straight ahead (as opposed to angling inward). Depending on the size of the subject area the strobes will be closer or farther apart. Lage scenics require long strobe arms. Remember, however, that the viewer will not be able to easily judge the size of your scenic because a wide angle lens will distort that. Start by shooting smaller scenes and then progress to larger scenics. For wide-angle photography, I use equal lighting ratios for both strobes. 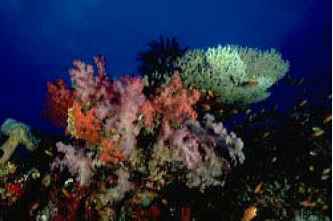 That means that the subject to strobe distance matched and has a power selection relatively the same for each strobe.What this really means is that if one side of the scenic is further awa,y the strobe on that side will be at a higher power. When using this technique proper bracketing is desirable and occasionally essential to find the best effect. In this case bracketing is with strobe power settings for a measured distance rather than f-stops and shutter speeds which will be matched with the setting to create a blue water background. In conclusion, I hope that the tips discussed above will be useful to you and that you will try them in a situation where you can get immediate feedback by processing your film and then looking at results. Always evaluate your results and keep notes about what works, what does not and what your preferences are. Consistent evaluation will cause your photography to improve and you will avoid reoccurring systemic mistakes. Although we usually tend to think of the digital camera as the best thing since sliced bread, there are both pros and cons with its use. Nothing is available on the market that does not have both a good and a bad side, but the key is to weigh the good against the bad in order to come up with the best of both worlds.